While most “named diamonds” have unique stories behind them, the way things are going with Pink Star Diamond, its story will soon be turned into a trilogy and who knows… maybe even a movie. The Pink Star diamond is truly a one in a million diamond – or as it seems, one in $60 Million. While most other notable, famous and expensive diamonds have origins dated back hundreds of years (for example the Dresden Green and The Hope Diamond), this “young” diamond is less than 20 years old. November 2013 it achieved the highest price tag a diamond had ever received when renowned diamanter Isaac Wolf made an offer of $83 Million. Upon purchase Isaac Wolf had changed its name to The Pink Dream. The next runner up came couple of years later – The Oppenheimer Blue Diamond that was sold for $57.5 Million. Sale was canceled a few months later when Mr. Wolf defaulted on his payment (according to IDEX) making it the most expensive diamond ever unsold. As a result, diamond went into Sotheby’s inventory, its name was changed back to the Pink Star and The Oppenheimer Blue is the most expensive diamond. Does The Pink Star Really Worth $60 Million? I have to admit, back in 2013, the first time it was told that a $60 Million Dollars diamond is coming to the auction I was dazzled. How can a diamond be worth that much? Who will buy a $60 Million Dollar diamond? But now, not only that I believe its worth more than that, we’ve also learned that there are people and even funds and groups of investors willing to spend that much out of the belief its even worth more than that. In fact it was Isaac Wolf that got me convinced the first time. But not because he bought it for over $80 Million, but rather because what he said afterwards that simply made sense to me. You see, the price per carat at $60 Million is simply $1 Million dollars per carat. As odd as it may be when speaking in millions – it’s not much! Pink diamonds are very rare. Pure fancy vivid pink diamonds barely exist. Internally flawless pink diamonds also barely exist. Pink diamonds above 10 carat barely exist. The combination of these three… well you guessed it – barely exists – well… We know of one that does! Also, for those who don’t know, diamond prices set per carat and the higher a diamond’s carat weight, so does its price per carat. As a result, a 2 carat diamond price is far greater than two 1 carat diamonds together. The only diamond that comes even near The Pink Star and it is The Graff Pink – a mesmerizing internally flawless fancy vivid pink diamond weighing 23.88 carats – less than half of the pink star’s weight. 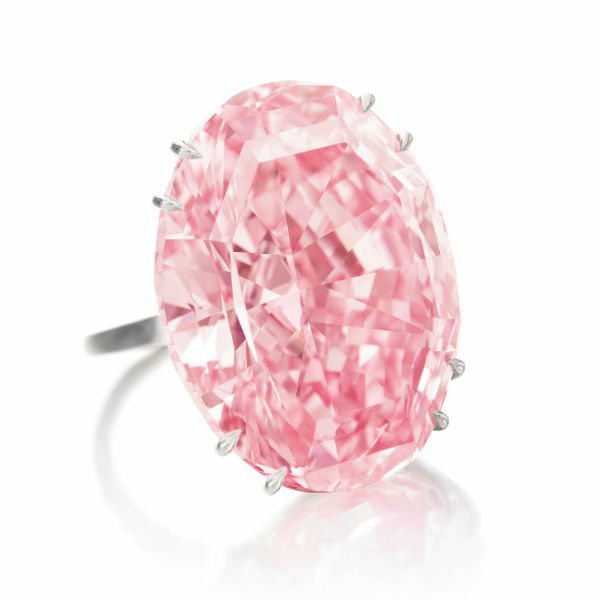 And it sold for over $46 million a few years back as an intense pink! Nearly $1.9 Million per carat which will place the Pink Star at over $100 Million!!! Will it sell or not? For how much? And to whom? In approximately 10 days on April 4th at Sotheby’s Hong Kong Magnificent Jewels auction we’ll get these answers! « Are Colored Diamonds more Expensive?